Gentle Yoga withEssential Oils, Come enjoy a slow flow yoga class with essential oils for added relaxation. Flow, Revive + Restore New! Nixa De Bellis has been practicing yoga for more than 30 years and teaching yoga since circa 2000. In the wide tradition of Yoga is a method steeped in science, art, philosophy and the alchemy of self. She offers yoga posture and breathing practices for healing on a daily basis, and as a means for self-reflection, self-understanding and betterment. Around the Wheel of the Year and for phasic lunar and solar situations, she creates Yoga Rituals to keep the Holy alive and well fed and for steeping in deeply Alert, Alive, Awake-ness! Pay attention. Stop Complaining. Keep going. Here's how. with Payal Parekh * New! Payal Parekh is a 500-hour nationally certified Vinyasa-based yoga teacher and received her 200-hour training from Exhale New York in 2014 under the guidance of Nixa De Bellis, Stefanie Eris, David Magone and Isaac Pena. In 2015 she completed an accelerated 300-hour Urban Zen Integrative Therapy training at Yoga Shanti, New York City and volunteered 50 hours at The Riverside Premier Rehab & Healing Center in Manhattan. In March 2016, she participated in a 50-hour restorative teacher training with Jillian Pransky at Yoga Works. Payal completed 20 hours of Yoga Tune Up Integrated Embodied Anatomy in July, 2016. 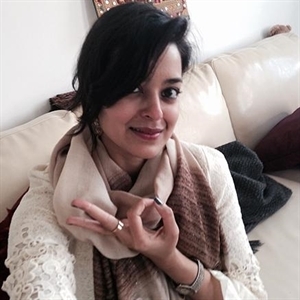 Payal believes in the power of movement and meditation in everyday life, which began when she was a teenager and student of Modern Dance and Ballet at Peabody Institute of The Johns Hopkins University. She tailors each class to fit the individual needs of her clientele with an emphasis to revive and restore mind and body. Under her guidance, her students are able to transform by building their flexibility, endurance and strength in a safe and encouraging atmosphere. She reminds her students to set an intention, "breath, strengthen, love, trust, and accept themselves" in every class. Payal is also a first-degree practitioner of Reiki initiated by Pamela Miles. She enjoys integrating Urban Zen healing modalities including aromatherapy, body scan, reiki, restorative posturing and breath work into her classes. Find stillness and greater depth through longer poses, slower sequences and attention to breath. Aromatherapy and Reiki hands on assist will help you bring your body and mind to a state of relaxation and rest. A great way to wind down your week and welcome the weekend. As a collective, we search for experiences that leave us feeling loved, uplifted, inspired, connected, and confident. Meditation has given us ways to feel these things deeper, longer, and more often. Not only that, yet we can use the tools of meditation to transform stored pain, stressful situation, and heal our past experiences leaving us more prepared for future endeavors. This class will supply you with the tools and understanding of both mindfulness and meditation. We will discuss the core basics of developing a meditation practice before interacting with the body with some light yoga and then moving into a guided meditation. All sessions are recorded and shared with the group so you can have recordings of the guided practices to work with at home. Beginners welcome. Please bring a pen a paper. This creative, flowing, and alignment based yoga practice links conscious breath with mindful movement. Each class is crafted to mimic the expansion and contraction of the breath, explore specific movement patterns, and work towards peak poses in order to coax the practitioner's attention towards the sensory experience of moving with breath to deepen the practice.Students are encouraged to use the asanas for self exploration and to seek balance between strength and flexibility both on and off the mat.